When working with hazardous chemicals, it's vital that you protect your hands properly. 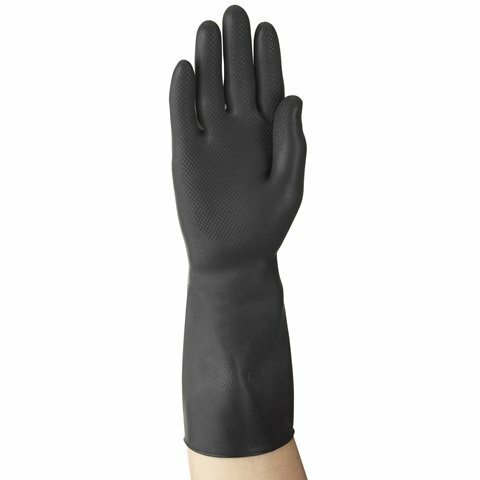 The Marigold Industrial AlphaTec 87-118 Chemical Resistant Latex Gauntlets provide superb resistance to water-based chemicals with a robust and flexible design that makes them suitable for many industrial applications. With a 100% cotton flock lining, these gauntlets also provide a great level of comfort to the user. The 87-118 are designated Category III gloves, meaning they have a complex design which is intended for the highest levels of risk. The Marigold Industrial 87-118 are supplied in five different sizes, making them suitable for the majority of users. Please measure the circumference of your hand around the knuckles (excluding the thumb) with your hand open and your fingers together, and the length of your hand from the tip of your middle finger to your wrist.